A new superfood - well, superdrink - is being hailed as a health fix for the likes of arthritis and even cancer. Kombucha (pronounced kom-BOO-cha), a fermented tea drink, might not be the miracle beverage it first appears though. We sort fact from fiction. It's a centuries-old fizzy drink from Asia that tastes quite sweet and tart, made by fermentation. To make kombucha, a symbiotic culture of bacteria and yeast (known as a scoby) is added to a mix of sugar and tea. In the fermentation process, the tea and sugar are fermented by the scoby, which comes to look like a mushroom - giving it the nickname 'mushroom tea' - resulting in a tangy-tasting drink. 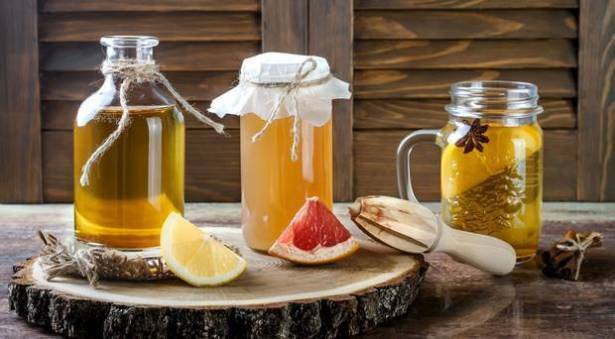 It's possible to vary the flavour of kombucha by using herbs, spices and fruit. You can buy kombucha online and from health food shops, but you can also get your own scoby and make it at home. However, experts have warned about brewing your own - it needs to be researched properly and done in sanitary conditions. According to dietician and nutritionist Ellie Krieger, writing for the Washington Post: "Kombucha is highly acidic, contains sugar, B vitamins and antioxidants, as well as some alcohol that results from the fermentation process. It has about 30 calories per eight ounces (mainly from the sugar), which is considerably less than other soft drinks." The fact it's lower in sugar than many soft drinks has been one of the reasons it's become so popular among the healthy eating set. Ellie adds: "Kombucha, when raw or unpasteurised, is rich in probiotics, good gut bacteria (like those in yogurt) that have been shown to boost immunity and overall health." However, probiotics do not survive the pasteurisation process, and certain people, including pregnant women and those with a compromised immune system, should steer clear of unpasteurised kombucha. Regular drinkers have reported health benefits ranging from weight loss and detoxification to stopping hair loss, improving liver function and aiding sleep and digestion. However, some of these, as well as claims that it can cure cancer, have not been proven. And there have also been reports of not-so healthy side effects from drinking kombucha regularly, including excessive build-up of acid, causing acidosis and liver damage presenting in jaundice, tummy upset and allergic reactions to the mould. In 1995, one woman died and another was hospitalised with severe acidosis, after drinking their own home-brewed kombucha every day for two months. As with most food and drink - it's a case of everything in moderation.